I have recently made this top for my Mum, for her birthday. (New Look K 6483) The pattern claims to take one hour* with an asterisk, the small print being that this should be sewing time. However, it took me more like two and a half* 1.because I’m so novice, 2.because I wanted my binding to be the neatest in the world and 3.because I inserted and unpacked an entire sleeve! Major sulk at this point. Though possibly not the most seasonally appropriate (I was going to put sleeves in but it seemed the bunch round the neck- a common problem for me- so I left them out) I still think it’s really sweet and will really suit my Mum. This is my first venture in to making a clothing gift for someone, my lovely Mum being the perfect candidate. It means that you put so much more in to it but this is something I’m trying to do with all my makes anyway. It was tricky though because she couldn’t try it on along the way and I just had to hope it would fit. I got so jealous of the way it turned out though that I made myself this top following the same pattern. Then because it’s so easy, I made this cute chiffon top, ready for Dublin too! I did this super cute contrast binding, which I love. I feel like this is a genuine proud moment for my little label! I also used the binding on the side slits, another first, so I’m glad they turned out so neat. Although the pattern didn’t call for it I also added a little zip for another feature and just in case it was needed. She loved it and said she could see all the work that has gone in to it. I’m really pleased my first hand-made clothing gift was so well received! A quick T-shirt… Getting my Chiff-on! Happy Friday everyone! Today is Dublin day for me! Hooray! I promised it was going to be a me-made trip so I’ll update you all when I get back. With this in mind I was after a top for with jeans for the trip. I had a flick through my pattern collection, which is still quite small (but growing) and couldn’t find anything, so I returned to my old faithful New Look K6483 1 hour pattern, which is fast becoming my go to pattern for t-shirts, as it fits so well without alterations and is super quick. I used it previously for this t-shirt. I promise I have ordered some different top patterns to try, so watch this space. I had some blue chiffon fabric with a white pattern so I cut it out with the intention of this being a slightly smarter t-shirt. I used the front piece which allows for a lower neckline and then extended the sleeves slightly, just to change the pattern up a bit. I used a blue ready-made bias binding on the neckline and on the edges of the sleeves. I tried to use a narrow hem (and failed again!) on the arm edges so I changed my mind and used the same binding. When I came to turn the binding inwards, I thought it looked quite attractive poking out of the edge so I top stitched it and left it as a bit of a feature. I don’t know whether this is a technique that I should’ve realised I was doing or whether I’ve just made it up!! I like it either way. The neckline I turned as normal. After giving up on quite a few sleeve inserts recently I’m pleased that these worked. I used the overlock stitch on my New/Old machine to overlock the side seams and finished it by turning the hem up twice. Easy! Obviously I knew as I was sewing this that the top would be see-through, although it’s not as bad as I expected, I will probably still wear a navy or white vest under it. I don’t see the harm when so many tops call for that at the minute anyway. In the pictures I’m wearing a black vest underneath it and my black work trousers but I intend to wear this with jeans. I forced the hubby to take some pictures before I pranced off to Ireland; we’d just set up out Game of Thrones monopoly game (we are so rock and roll) so this is me with my glass of wine ready to win! The wine helps! Hers a sneak peek at the little luggage tags I’ve made as a little gift for my mum and sister (or as a bribe to get them to take lots of pictures of me in my makes!) This were made using scraps from a cute make which I’ll share soon. Aren’t they cute?! So, off I go on my weekend away, I’ll share some pictures of my makes in action on my return. I’m also in the middle of making some pretty cool dresses that I’ll share soon! But for now, Guinness is calling me, so happy weekend everyone! Pretty PJ Pants and the Nicest Neighbours! I had some of this gorgeous floral polycotton left from making this 1970s vintage dress. So I printed a pattern for some PJ bottoms thinking it would fit quite nicely with The Monthly Stitch’s Nighty Night September challenge. I used narrow seams and zig-zagged the edges. I also had my first try at button holes (which need some major improvement) in order to put this ribbon in, purely for decorative reasons. I created the band and inserted the elastic before sewing it shut. I did a nice thick hem on the bottom and I’m so so pleased with the result. I used the XL size on the pattern but it needed extremely small seams to fit me. It meant that the waist band was too small so I had to recut it, they’re a great fit though! This fabric is so soft, comfy and so easy to work with that I may have just ordered some more in red! IN MORE EXCITING NEWS! 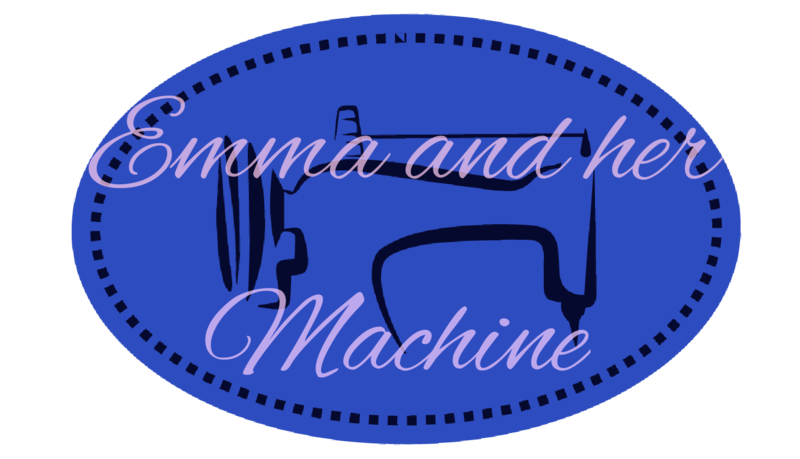 Check out my New/Old sewing machine! My father-in-law was chatting to his lovely neighbours about my sewing escapades and she gave him her sewing machine for me!! How exciting is that?! It’s an old Riccar Reliant 58. We looked it up and the company is Japanese and was quite influential in electronic sewing machines at the time. We reckon this one was from the early 1980s. Isabel bought it on the Isle of Man and has really looked after it (she was a keen seamstress in her day and tells me she was in to tailoring and even made her own wedding dress.) She thought I would get more use out of it now though. It runs like a dream and I hope I can do it justice. It overlocks, does buttons and embroidery. You can do free embroidery on it too for letters etc. It comes with all the original parts. She’s also donated me the bobbins, needles and an eyelet set. There’s so much I’ve wanted to try which I can now do. I literally cannot wait to get my hands on it!! AND… alongside this my mother-in-law gave me a Christmas ‘put away’ of new pinking shears, a large and small rotary cutter and some Christmas fat quarters!! Eeekkk! Get me on that machine! I say this but what I’m actually doing is settling down for a Friday night with a glass of wine, my lovely hubby and Sherlock! In my new PJs of course! Pre-blog, I attempted New Look 6020 in this green fabric I picked up in a shop in Wales, purely because I had enough fabric to do it. This is the same pattern I used to make the bodice in this blog. The dress turned out OK (just) but didn’t fit great and even though it travelled to Northumberland and flew all the way to Rhodes with me, I still didn’t wear it. Excuse the bad photo, it did not know it was going to be blogged! So, I’ve decided to refashion it. I unpicked and removed the bodice from the skirt and reattached the skirt to a waist band I made using the remaining fabric. I stuck a green invisible zip in the back and it was done! The skirt was originally made from 6 panels and fit in my self-drafted waistband perfectly, which was a surprise! The panels make it a lovely, A-line shape, which is helped by the floaty fabric. Hopefully I will be able to wear it more like this, though winter is coming (blatant GofT reference there) and I’m not sure how well it will go over tights. I left the length so I didn’t have to touch the hem, which I had zig-zagged originally. Easy! I wore this with a white blouse for work and received lots of compliments! I think the shape is super flattering. The waistline means I don’t need a belt, it just looks good with one! To make sure that my blog is regular, my plan is to post every Friday about my makes or a least my plans for making that weekend. What else does a hard-working 9-5er have to do on a Friday? Feel free to drop by and have a look at what I’m up to. I have been browsing vintage patterns on Ebay for some time and have been rather indecisive about whether or not to buy them in case I couldn’t get them to work, what with size changes and all. After seeing the Vintage Pledge on A Stitching Odyssey I thought I would have a go so I bought this 1970s pattern by maudella, who I haven’t heard of before, from a charity seller on Ebay. I used this cotton fabric, which I thought fit the theme well. This is the first time I have worked with a dress pattern which is all in one (not a separate bodice and skirt) which was nice and meant it was quite quick. I made LOTS of alterations from the original pattern though. Firstly I omitted the collar and the provided facings and used bias binding in the same fabric on the neckline. I also cut the front piece on the fold as I wasn’t sure whether I wanted the zip or not (turns out not). Instead I ignored the front zip and added a side lapped zip instead. It’s not the neatest but certainly passable and not bad for my first try. Secondly I omitted the contrast cuff on the sleeves, though I will put them in if I try it again just for the skill practice. I also added a little box pleats at the top of the sleeve for added detail. I think it adds to the Vintage feel to have the sleeves a bit stuck up like that. I did a deep hem because I know from taking up some of my Nanna’s old dresses some years a go that 70s dresses tend to have a deep hem. I may be wrong but it feels and looks right. This dress is almost trapezium in shape and isn’t very fitting past my chest at all but I like the shape of it. It feels casual and definitely skims the lumps and bumps! If I did it again I might take it in a bit at the waist though. The long sleeves are just right for me too, I’m not a huge fan of sleeveless dresses or tops. P.S. judge my bookshelves as you will! Green and Red Dress… Check! Can I start by saying I don’t care if you don’t like my horrible pun of a title. Personally I think I am a genius!! Anyway, a much longer zip arrived- Yay! So naturally I inserted it in to the length of the dress. Sadly, it made my checks go so bit wonky at the bottom of the bodice. 😦 Then I completed the hem and my New Look/Prima dress mash-up is complete and perfect for my work style and it really brightens up my work wardrobe. Now that I’ve tried it; I will definitely try different fittings and pattern pieces because it meant I could fit a larger top half to a small bottom. I just need to learn to do this with more skill! It fits but it is very SNUG so no pics of me wearing it until a few more weight watchers meetings I reckon! So glad to have this one complete though! My Mum came to stay at weekend and this was hung in the spare room; she spotted it and was impressed with my improving skills so yay! Got to work on some pattern matching though! I am so excited to have discovered a local fabric shop, All Fabrics in Staylbridge. On a recent visit I bought this gorgeous red cotton with little houses printed on it (Mori Girls 1148 by Jilly P for Dashwood Studios) It’s so cute! At the risk of appearing like a one trick pony, I knew I wanted to make a skirt with this. It wasn’t wide enough for a circle skirt so I wanted to aim for a pleated skirt. I followed this tutorial by It’s Always Autumn. Even though she does it in a knit, I followed the same principle for the cotton and added a zip as I knew it wouldn’t stretch. I tried it on and with help from the hubby (I say help, he actually threatened he was going to put the pins in his eyes) we chose and pinned a length at my knee to modernise it and counteract the frumpiness the pleats bring. I just did a standard hem. It’s so neat inside too! I wore this to a BBQ at my Mum’s house, to squeeze out the last on the sunshine. I wore it with a light denim t-shirt but I think it will go with a lot of my tops. BONUS! We had champagne and strawberries, just because. And I took a lot of banter about being a sewing geek as usual! This is a very zoomed in pic my mum caught of me looking at my her fuchsia, which she bought when I was born. Thought it looked very bloggy! I really feel this shows that my skill (and my patience) are coming along! I am going to add this to my Dublin wardrobe- my Mum, sister and I are going to Dublin for a weekend in 3 weeks and my aim is to take a me-made wardrobe as much as I can! After making a New Look K 6483 top for my Mum (blog to come post birthday), I was a little jealous as it went so well. So I decided to make my own. I had some black four way stretch fabric which I got in a bundle from Abakhan. I wanted to try and sew with stretch and thought this would be ideal (it’s like fabric you’d wear for gym wear only thicker) but I thought it would look smart. I already know the pattern comes together great and fits pretty much from the pattern so I was away. So, here it is- my boring black T-shirt. Now, you may have guessed by now that it is not as boring as I am making out. After arguing with myself (quite aggressively I might add) about my need to add details because I am making it, wondering why I can’t be happy to throw together a plain top; I toyed with the idea of adding a ruffle at the neckline, or a contrast colour for the back, before settling on this chunky, visible zip. I am happy with this decision, I think it adds detail without being OTT. It looks modern and it a great wardrobe staple, don’t you think? And because I struggled to leave it there… look. I had a stretch orange/red in the same bundle which I used to hem my t-shirt, just to placate my need for detail! I love little inside details like this. I expect to be getting lots of wear out of it. It goes really well with this skirt. Happy with my somewhat detailed t-shirt! I had some of this woollen- type stretch material from a bundle bag from Abakhan. I followed this tutorial for a circle skirt from Dreaming of Avonlea. This was my first time drafting my own pattern and the instructions are fab and undaunting. However, I must have work the measurements out wrong as I measured for a 3/4 skirt and had too much fabric so it has turned out more of a 2/3 circle skirt! I’m still happy with it though. I’m pleased with the waist, which looks really neat, even though I didn’t stitch in the ditch as recommended; I think because the fabric is thick, it just seemed to miss it. The zip went in pretty nicely without a seam too. Hooray! It always surprises me that I can do this! In the tutorial, you are warned the hem is long, but wow, is it long! I thought it would never end. I zig-zagged the edge and turned it up once as I didn’t want too much bulk or to lose any length. It goes great with black and I’m really pleased with the length; I don’t like skirts shorter than this. I’ve got some blouses that will match up pretty well. And, finally, check out this cute gold and white button! !